Ypsilanti State Hospital, with a capacity of thirty-three hundred patients, was located eight miles south and west of Ypsilanti and ten miles south of Ann Arbor, Michigan. Built in 1931 and located on twelve hundred acres, the hospital provided well equipped kitchens, cafeterias, bakery, laundry, warehouses, dairy, orchards, and farm land. The recreational facilities included men’s and women’s gymnasiums, athletic, music and motion picture equipment, golf courses, and tennis and shuffleboard courts. Fifty men were selected from Mennonite Central Committee base camps at Fort Collins, Colorado CPS No. 33, Downey, Idaho CPS No. 67, Hill City, South Dakota CPS No. 57, and Belton, Montana CPS No. 55. Another twenty-five men arrived later. In 1944 and 1945, two summer service units of thirty-six women and fifteen women respectively, worked at the hospital. Lois Gunden of Goshen College led the units. 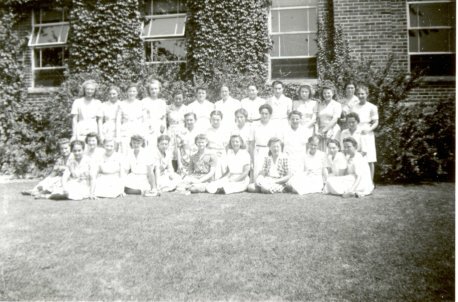 In August 1943, a CO girls group formed at Goshen College. Known as “COGs”, the women expressed their convictions on peace and war, and sought to support the stands taken by young men. The women committed to relieve human need, sought locations and opportunities to act on their commitments. The unit size reached seventy-five men. 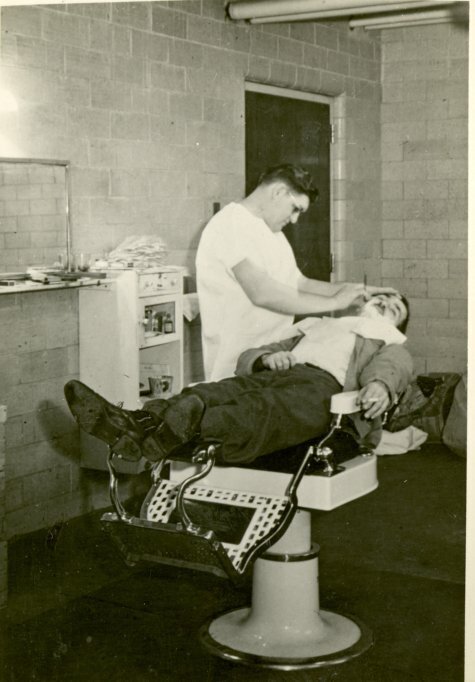 An average of fifty men worked as ward attendants; fourteen worked in the three kitchens preparing patient food; the remaining assignees filled roles as electrician, occupational therapist, farm helper, warehouse attendant, grocer, laundryman, barber, recreational therapist and hospital driver. The length of the work week varied according to role, with ward attendants working a fifty-four hour work week with the sixth day off. Kitchen personnel worked forty-eight hour weeks, and those in office roles worked a forty hour work week. John J. Fisher, Jr. wrote about his experiences at the hospital. Here the assignment on the wards gave me at first hand a real sense of daily constructive service. Here I gained another kind of invaluable education, from bed pans and epileptic seizures to the dilemmas of a short-staffed state institution. There was also an inevitable tension with state employees, many of whom had little knowledge of our legal status or agreed with our conscientious scruples about the patients in our care. At one time there appeared The Buttercup News which savagely ridiculed us as “yellow bellies” and self-righteous interlopers on patriot turf. 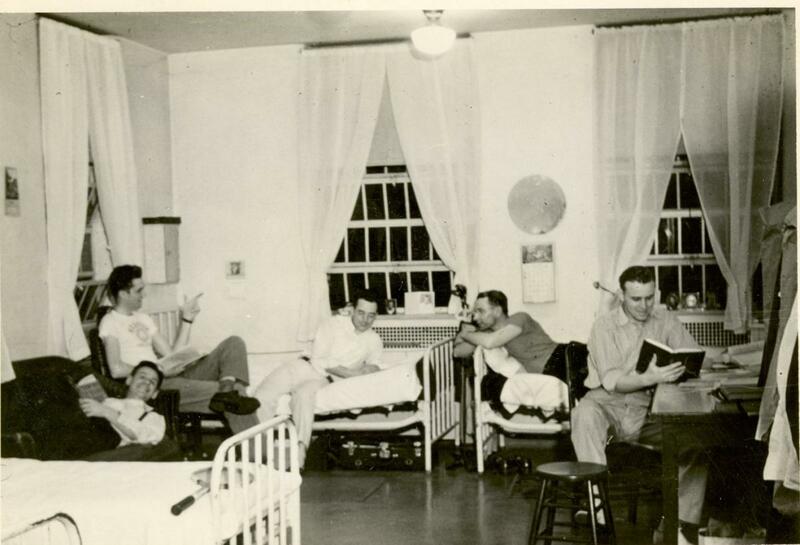 Single men lived in comfortable living quarters in a former patient ward. Married couples lived in the employees’ building. Selective Service Directive # 3 specified compensation and benefits for those working in hospital units. Assignees were to receive food, living quarters, laundry service, uniforms or work clothes, or a cash equivalent not to exceed five dollars, a maintenance allowance of ten dollars per month, the same medical and dental attention offered to regular employees, transportation by the most direct route possible to and from camp, and worker’s compensation insurance provided by state law. At Ypsilanti the men received no salary, but rather a maintenance allowance of fifty dollars per month from which was deducted thirty-five dollars for food, living quarters and laundry. Hospital superintendent Dr. O. R. Yoder, a former Mennonite and graduate of Goshen College, was both supportive of the CPS unit and also was recognized as running a progressive hospital. He regularly made himself available to both unit leadership and members. He also expressed gratitude that the unit “came quietly into the hospital and accepted their assigned duties”, even though the unit was frowned upon by labor organizations and veterans groups. The men formed unit committees (athletic, music, library, shop, religious life) to plan activities. A Unit Council with representatives of each of the committees and staff not only brought matters to the men for discussion and action, but also held men in the unit accountable. In mental health hospital units, the CPS unit director served as an assistant director reporting to the hospital superintendent. Assistant directors, in addition to being in direct charge of unit personnel, prepared reports for MCC, the National Service Board of Religious Objectors (NSBRO) and the Selective Service. The educational program focused on relief training. A group of twenty-five men took evening courses in preparation for foreign relief, including French, Spanish, mental hygiene, international relations and Mennonite relief work, Mennonite history, social work and Bible. Women from the summer service program, as well as those who participated in a year-round program, took courses in foreign relief work as well. Ruby Martin Zook worked at the hospital beginning in January 1944 as part of the CO women’s unit. 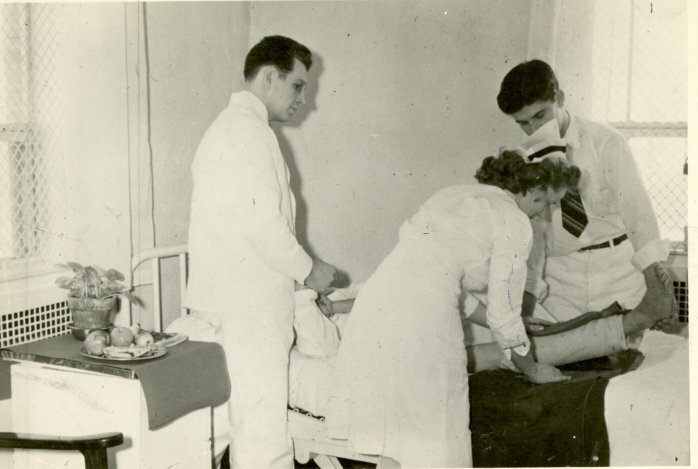 Thelma Miller Groff worked on Ward C.
To give patients my listening ear and to keep believing in the humanity of each was part of the challenge. I remember how good I felt when I was able to affirm Mr. Thompson for his faithful visits to his wife each week. He had not realized that his wife was much quieter in her padded cell after his visits. Our unit leader, Lois Gunden, arranged for us to attend two summer classes all summer. Both gave meaning to the experience. One class taught by the hospital superintendent dealt with how to better understand mental illness. Lois taught a class for those who were preparing to do relief work after the war. Women participated in many of the activities including the CPS choir, which frequently presented programs for patients. Men actively participated in softball games with others in the unit and with patients. With respect to interaction with church communities, since Mennonite communities existed near Ypsilanti, many Mennonite speakers and ministers visited the camp and contributed to the program. The unit held Wednesday evening prayer services, Sunday morning Sunday school, and Sunday evening services. Sunday offerings averaged $30 dollars and were contributed to the MCC War Sufferers relief fund. The men published Ypsi, much like a yearbook, which contained photos and a history of the unit.